The dangers of welding are not isolated to the activity itself. As explained by Luisa Coutinho and Eurico Assunção, safety must be a priority before, during and after welding processes. Special processes in manufacture are those processes for which the quality requirements of the product cannot be verified by final inspection, and which require special competences before, during and after the operation if compliance with such quality requirements is to be assured. Moreover, the environmental impacts and the health and safety risks related to special processes can play a considerable role in the whole fabrication process of a product. Welding is an example of a process where health and safety should be considered, not only during the welding process, but also before and after the welding operation. Welding and its associated techniques are the most widely used professional technologies for manufacturing constructions and goods in different areas of industry. Table 1 gives examples of industrial sectors where welding is an important manufacturing technology. 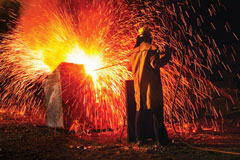 Welding is the process of permanently joining two or more materials together, usually metals, by heat and/or pressure. When heated, the materials reach a molten state and may be joined together with or without the addition of filler materials. Many different energy sources can be used for welding including gas flames, electric arcs, electric resistance, lasers, electron beams, friction, molten metal baths and ultrasound. Welding includes joining methods as diverse as fusion welding, forge welding, friction welding, braze welding, brazing, soldering and explosion welding. Welding with proper protection is a safe and healthy manufacturing process. The first step in managing the risks associated with welding processes is to identify all the hazards that have the potential to cause harm. The second step is to assess the risks associated with a given welding application. As summarised in Table 2, welding is a potentially hazardous activity as it generates fumes, noise, radiation, electric current and electromagnetic fields (EMF). Precautions must be taken to avoid electrocution, fire and explosion, burns, electric shock, damage to vision, inhalation of poisonous gases and fumes, and exposure to intense ultraviolet radiation. The identification of control measures is therefore an important step to achieve prior to starting any welding job, with the aim of eliminating the hazard and its associated risks. As a technology used in manufacturing for more than a century, the safety risks of welding have been widely analysed and information about preventive measures is easily available. A review of the literature indicates that potential hazards are numerous and descriptions are given of types of the welding and materials used. These dangers have been broken down into optical, heat, respiratory, acoustic, ergonomic and further hazards. The most obvious risk is to the eyes, since arc radiation exists in any arc welding process. Ultraviolet and infrared radiation both present potential problems because of their effect on the eyes, skin and other parts of the body. In the intensity of this hazard, however, lies an element of safety, since no-one can work unless his eyes are adequately protected. Both the electric arc and the oxyacetylene flame give temperatures as high as 3,000º C. The effects of heat are more difficult to assess than those associated with radiation, because psychological as well as physiological reactions may adversely impact on efficiency and production. Welding also produces fumes. Welding fumes are a complex mixture of very small condensed solids and gases. The base and filler metals, fluxes, coatings and shielding gases all contribute. Even heat and chemical changes to the surrounding atmosphere from the intense radiation can add to the mix. The effects of welding smoke on a person will depend on the particular components of the smoke and how much of it the welder inhales. Some effects may occur shortly after exposure - these are acute effects. Long term or chronic effects may not become apparent until after years of exposure. The health risks associated with welding gases and fumes are determined by the length of time one is exposed to them, the type of welding, the work environment and the protection used. Some welding processes are a significant source of noise in the work environment. Another source of noise emission is the gas stream flowing out of the nozzle of a gas, plasma or welding torch. Also, a welding unit itself generates noise of considerable intensity; for example, from the blower and pump. The level of noise generated during welding processes largely depends on the welding method, parameters of current, welding position, diameter and sort of electrode wire, as well as the type of shielding gas. Correct ear protection is required in each case. In many cases musculoskeletal disorders are caused by poor ergonomics of the shop floor, and by product design with complete disregard of the manufacturability at the welding shop. The reduction of the physical load on welders by improving shop floor ergonomics and tools has been addressed and software for assessing ergonomics in welding has been produced. Undoubtedly, hazards exist with any type of welding and there are more hazards than the ones referred to above, but with the knowledge and awareness that now exists they are mostly obvious. With proper safeguards taken for their control they should offer no serious menace to health. Fabrication by welding is a complex process that cannot and must not be limited to the welding phase alone. In order to guarantee the quality of the weld, other activities before, during and after welding should be performed, such as material management and preparation, pre and post heat treatments, tests in the workshop and final treatments. All of these activities, however, can also give rise to the risks of accidents. The European Federation for Welding, Joining and Cutting (EWF) has developed a high integrity and specialised certification system to assure companies are in compliance with standard EN ISO 3834, but also with the EWF requirements for environmental and health and safety management. This system is referred to as the EWF Manufacturer Certification System (EWF MCS). The primary intention of EWF MCS is to ensure that manufacturers are competent and exercise adequate control of the special process of welding. This is so that customers and others can have confidence that the welded products they produce will comply with the regulatory and/or contractual requirements, not only in terms of quality but also environment, health and safety. The EWF Health and Safety Management Scheme (EWF SMS) was developed in accordance with the British Standards Institution (BSI) 8800. The scheme covers welding and allied activities as applicable to the company’s operations. The Certification may only be applied to manufacturers who can demonstrate that their welding and allied activities are already appropriately controlled and optimised from the point of view of production. One way of demonstrating this is by complying with the EWF/IIW ISO 3834 scheme. A manufacturer intending to implement a health and safety management scheme should initially perform a risk analysis of all the welding fabrication processes, in order to identify the aspects of activities related to health and safety of personnel and to determine the relevant risk level. As a final result of this analytical process the manufacturer will be able to design, where appropriate, a health and safety management plan, showing the technical actions aimed at reducing the risk level and improving its health and safety management scheme. The EWF SMS also has a set of requirements related to the welded product’s fabrication process, which should be adjusted and graduated according to the nature and importance of welding health and safety risks that may cause workplace accidents. Such implementation cannot just be based on analysis and implementation of procedures, but also on providing training to personnel and welding coordinators to ensure that all those involved in welding fabrication activities are alerted to the welding health and safety scheme established to avoid potential accidents. The EMF Directive (2013/35/EU) published on June 26, 2013, states that employers in the European Union (EU) will be required to ensure that workers’ exposure to EMF is assessed, minimised and stays below the levels set out in the EMF Directive4. Since its approval, the new directive in now considered official EU law and all member states must bring into force the laws, regulations and administrative provisions necessary to comply with this Directive by July 1, 2016. EMF are a form of electromagnetic radiation and are defined as non ionising radiation, having both magnetic and electric field components varying with time at frequencies up to 300GHz. Exposure to EMF related to welding is not a new phenomenon. Magnetic fields generated by several arc welding processes will induce circulating currents within the human body, which can cause stimulation of nerves and muscles5. The strength of these currents will depend on several factors, such as the intensity of the current, the distance and the wave form of the welding process. Previous surveys of the magnetic field strength to which the operators are exposed have shown that the exposures are, in many instances, high when compared with the recommended exposure limits mentioned in the previous version of the EMF Directive (2004/40/EC). Project EMFWELD is currently being coordinated with the objective of improving the knowledge of EMF in welding and inspection. This is an EU funded research project that will develop an interactive web based software application to calculate and assess workers’ exposure to EMF in metal fabrication, particularly welding and non destructive testing (NDT). Some welding and NDT processes are believed to be high emitters of EMF, but there is a lack of good information on which to base an assessment of welders’ exposures and to compare this exposure with the limit values. In many cases a simple measurement may not be sufficient to demonstrate compliance with the forthcoming Directive, so complex numerical modelling will be required to make a full assessment. Without clear guidance and support, European industry and particularly SMEs will be put at a competitive disadvantage. EMFWELD aims to lower SMEs’ cost of compliance with the forthcoming EMF Directive by providing an innovative, economic, easily accessible and accurate EMF exposure risk assessment software toolkit. The expertise of the project partners in welding processes, measurement and numerical modelling of EMF will ensure the successful development of this software application. Health and safety in welding is assured through the implementation of correct protective measures by companies using welding, but also by providing adequate training to all employees. It is imperative that all employees are trained in welding safety. If we are all armed with the education to make the right choices, workers can support one another to ensure company, and, indeed, industrywide safety.